Double Bollinger Bands Strategy is a mechanical trading strategy. It means it doesn’t need analysis and interpenetration to decide whether the formed trade setup is strong enough to enter the market, or it is weak and you’d better to skip it and wait for a better one. It is either black or white. It means either a trade setup is formed which means you should enter the market, or there is no trade setup at all. 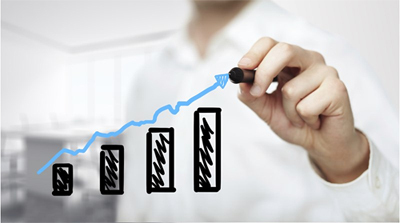 Such a mechanical trading system is good for those who have no patience and knowledge for analyzing the markets and locating the trade setups based on the technical analysis or candlestick signals. It just tells them to enter a market or stay out. Therefore, sometimes it can have a very low success rate specially in some months because the markets conditions change and a mechanical trading system can’t be used as reliable tool to trade any market any time. This is what you have to note if you want to use such trading systems. The reason I am sharing this system here is that some people always ask about it. This system has been introduced to Forex traders as an ultimate trading system that makes money for them consistently. I just want to clarify that it is not the Holy Grail, and because it is mechanical, it can generate consecutive losses sometimes. What Is Double Bollinger Bands Trading Strategy? This trading strategy which is called “Double Bollinger Bands” or DBB, is very simple, because although you use candlesticks in this system, you don’t have to be worried about the candlestick patterns. You don’t have to know the weak and strong candlestick patterns and differentiate them from each other. You don’t have to know anything about technical analysis and other complicated techniques. In spite of such a simplicity, this trading system can generate more trade setups, while you don’t have to spend any extra time at the computer. You just check the daily charts for few minutes per day, if there is any trade setups based on this system, you take the positions, set the stop loss and target orders, and come back the next day. So, this trading system is good for those who like to take some positions every day and can’t handle a day or a few days of having no trade setup. However, you have to strongly consider that having more trade setups and taking more positions doesn’t necessarily mean more profit. In most cases it means more losses. You don’t have to spend any extra time and energy to follow this system. You don’t have to manage your positions too. It is a completely mechanical trading system, which means it is either white or black, and it doesn’t need any analysis and interpretation. There is either a trade setup on the chart, so you take your position, or there is no trade setup, and so you check the chart the next day. You don’t have to analyze and consult different time frames, indicators, lines and… to decided whether you should go for the trade setup or you’d better to skip it because it is not a strong trade setup. It is not like that at all. There are only two conditions: (1) there is a trade setup formed on the chart, so that you take it, and (2) there is no trade setup on the chart, so that you check it again the next day. It doesn’t take you more than a few seconds to check each chart and see whether there is any trade setup already formed or not. 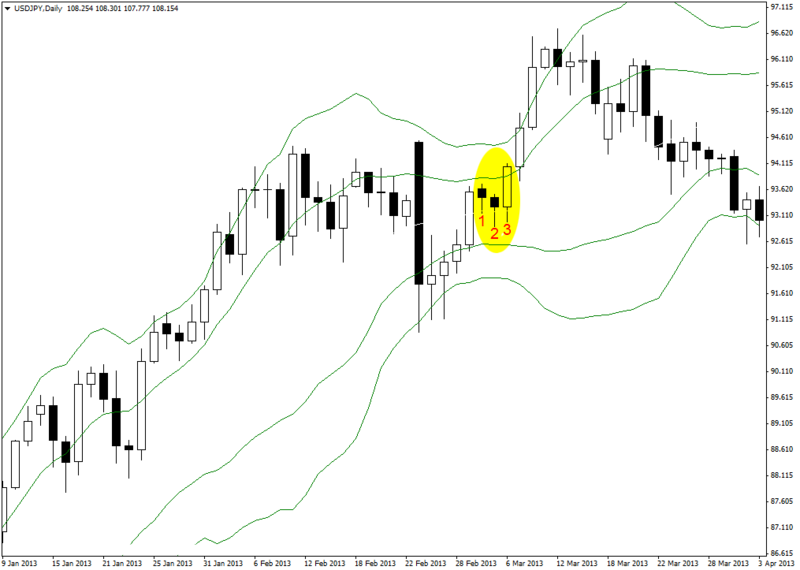 How Does The Double Bollinger Bands Strategy Work? All you have to do is adding two sets of Bollinger Bands indicator. That is why this trading system is called “Double Bollinger Bands Trading Strategy”. 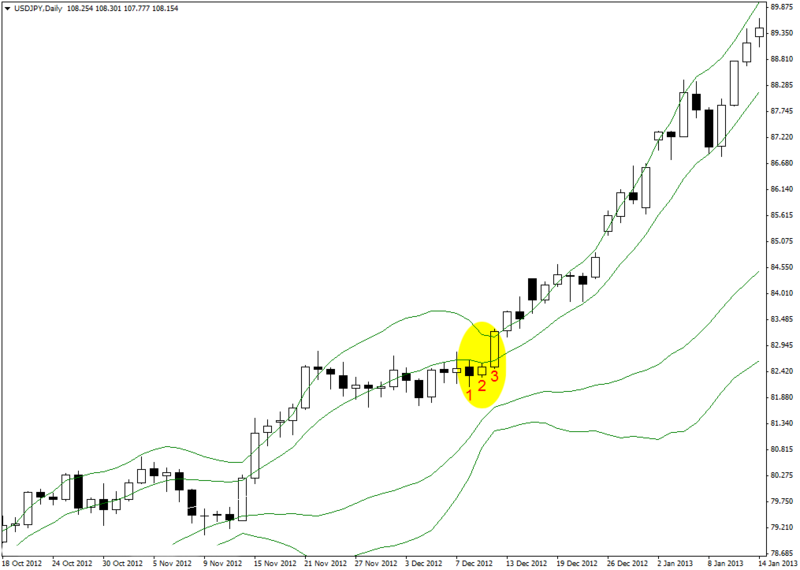 In this article, I refer to this Bollinger Bands indicator as BB2, because its deviations is set to 2. 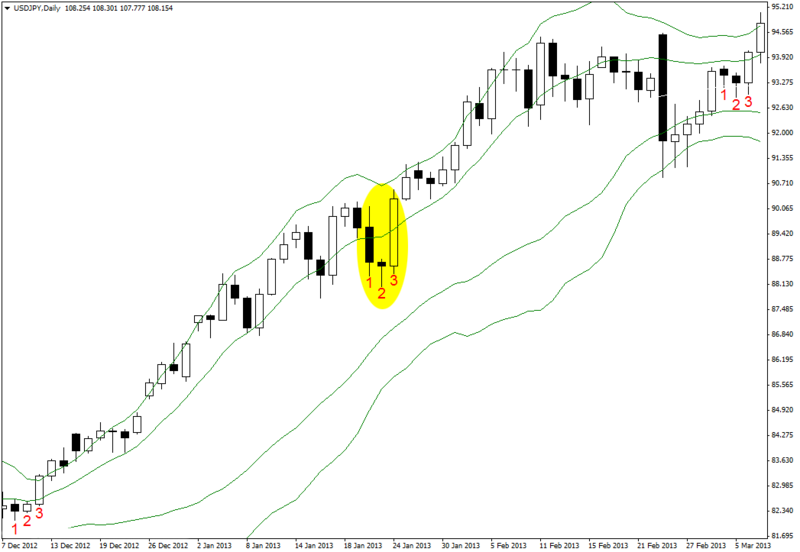 In this article, I refer to this Bollinger Bands indicators as BB1, because its deviations is set to 1. So the only difference of these two Bollinger Bands is in the deviations settings. The first one is set to 2 and the second one is set to 1. The outer BB has the default settings and its deviations is set to 2. The inner BB is the one that its deviations is set to 1. The Bollinger Middle Band will be the same, because deviations settings has nothing to do with it. Of course, in this trading system we don’t use the Bollinger Middle Band. We only use it to hold the positions to maximize our profit, but it has no role in forming the trade setups and taking the positions. 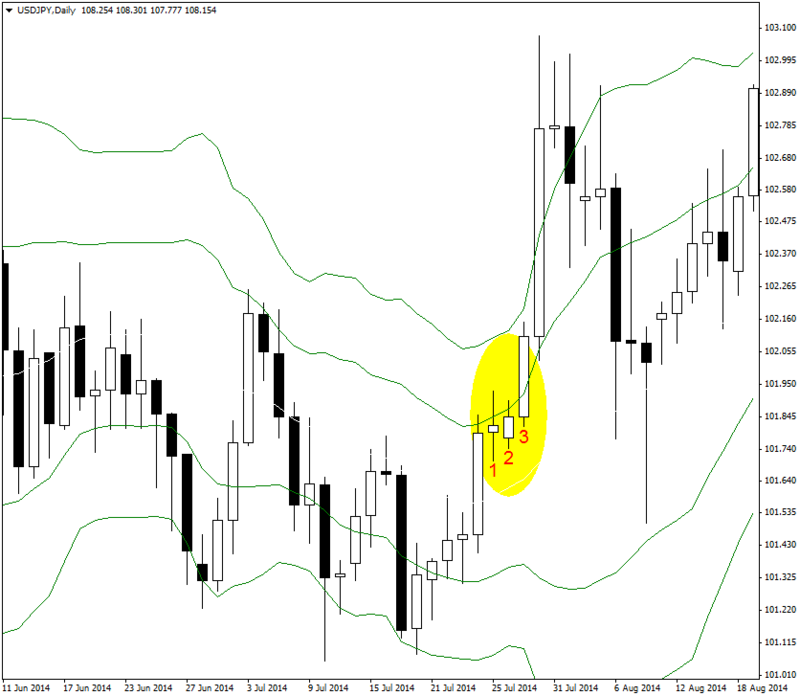 Double Bollinger Bands Trading Strategy is good for trading the trending, as well as the ranging and sideways markets. Stop loss has to be set at the low price of the candlestick which has pierced the BB1 upper band (I mean candlestick #3), and the target can be at least twice of the stop loss size (2 x SL). You can move the stop loss to breakeven if the price moves according to the trade setup for 1 x SL. For example, when your stop loss is 60 pips, then you can move the stop loss to breakeven if the price goes up for 60 pips. Of course I will tell you how to trail the price to maximize the profit in case you don’t want to get out with a 2 x SL target. Note: When candlestick #3 is too long, you can set the stop loss higher than its low price, not to have a too wide stop loss. To go short (to sell), you have to wait for one of the candlesticks to close below the BB1 lower band. Then you should check the previous two candlesticks to see whether their close prices are above the BB1 lower band or not. If so, you have a short trade setup (sell signal), and you can go short (sell) at close of the candlestick which has broken below the BB1 lower band. Candlestick #3 on the below chart has closed below BB1 lower band while candlesticks #1 and #2 have closed above it. This is a short trade setup. Like the long trade setups, the stop loss has to be set at the high price of candlestick #3, and target can be at least twice of the stop loss size (2 x SL). You can move the stop loss to breakeven if the price goes down for 1 x SL. How To Maximize Your Profit? As I explained above, this trading system is good in catching the trends. Therefore, you’d better to take the advantage of the strong movements and maximize your profit. When there is a strong trade setup, you can also take two positions with the same stop loss, when there is a trade setup based on the Double Bollinger Bands trading system. Set a 2 x SL target for the first position, and no target for the second one. If the first position hits the target, move the second’s position stop loss to breakeven and hold it. Of course, markets don’t trend all the time. Indeed they trend 30% of the time. It means you should not expect to make hundreds of pips from each trade setup. You can trail the stop loss if you like. For example when your initial stop loss is 80 pips, then you can move your stop loss further for every 80 pips that it moves accordingly. Double Bollinger Bands Trading Strategy works on all time frames, but I use it on the daily and longer time frames, because it is easier, safer and more profitable. Never think that you will make more profit if you apply this trading system on 5min or 15min charts. Trading the shorter time frames is nothing but headache, and you will not make more profit. I spend about 15-30 minutes checking the charts every day, but I am more profitable than day traders who sit at the computer for several hours per day, every day. I read your article again, and I would like to ask you one question, are there any specific rules for ranging and sideways markets? No. It is the same with trending and ranging markets. Looks like a very simple and stress free system. I will surely try this one out. Many thanks! Great article! Whole trading system in one page with easy words…. Very much helpful for beginner like me. I will increase my investment using this strategy. Will start following this strategy from the beginning of next week. Thank you for this article Kamel and God bless you. Thank you Kamel, looks interesting and simple. Is there no use for the BB2 middle band in this strategy? hi Kamel…thanks for yet another eye opening article..i have one request Kamel please dont stay too long without writing something for us…you guys are exceptional! Thank you Kamal for sharing. where can i find trading system? Glad to see you back Kamel. Thanks for sharing this – it looks great! I have used this with great results. I do add a third BB with a deviation of 3. It acts as a very strong support and resistance levels. Triple bollinger band trading system. 😀 lol. In an uptrend, if your #3 candle closes above the BB1 and the #1 and #2 candles closed below the BMB, will it affect the trade setup? Yes. It will not be the typical trade setup that I like to take. Just had to say thanks for a new trading system. I will be giving it a go. q1: according to this new trading strategy, on the USD/JPY daily chart ( AT THE END OF THE ARTICLE) we can go long near (3) because of white strong candlestick form and break out the BB1 upper band and two previous candlesticks closed below BB1 upper band. q2:same as above we should sell below the position (4) because of forming shooting star candle stick which breakout BB1 lower band and two previous candles that closed upper BB1 lower band. why it is not happened and you did not based on new strategy. Hi Behnam. I am sorry but I don’t understand what your question is exactly. Hi Kamel, Many thanks to you for sharing your simple trading system, God bless you all, just a question ….what pairs are better to be traded by this system? Kamal – thank you for what looks like a great strategy – and thank you for Kamel. Kamel – would you please look at the candle EURUSD for 2014-10-30 – if this were traded, (and it seems to comply with the system – except that candle 1 closed below the BMB), then it would be stopped out – would you please advise what you would do? – the move was potentially a powerful one (320Pips to the open order’s first exit point) and ran between bands BB2 & BB1. Hi Peter. I think the candlestick date should be different that what you mentioned. Please check and let me know. Thanks for your attention – you are right – I had both the date and pair wrong – it was the 2013-10-30 candle on the USDJPY daily chart – thank you for looking at this. Yes, that is a good example of a long setup. I was wondering how you would handle it – if you had had this trade on? Would you just let the stop happen? And then would you consider a re-entry based on the size of the 2013/11/08 candle plus the close of the 2013/11/06 candle being practically on the BB1 line? OR would this revert to a possible BMB continuation entry condition? It is a very interesting group of candles – in view of the rules. Sorry. If you mean 2013.10.30 candlestick on USD/JPY I would not take it because 2013.10.28 candlestick closed below BMB. Compare this with 2014.07.29 trade setup on USD/JPY daily chart, and you will see what I mean. the move strength of the 2013-10-30 setup was weakened by candle 1 not making the “close under upper BB1 rule” – the move started but due to a weak setup, lost motion and handed back control to the bears. Looking at it again, I see that bullish control only came in suddenly with the 2013/11/08 candle – but without a DBB set up. However, the 2014-07-29 setup was a strong enough setup to make 3 x stop – and even though control was given back to the bears – the candles were mostly small doji’s or bearish with longer lower shadows – all indicating that stronger bullish pressure was afoot. And this can be then seen with the 19 August 2014 DBB set up, which maintained bullish control, going on to make 595pips (for the second open order) until the first exit point – a ‘close below upper BB1’ in accordance with the rules. First, my regards to, Initially, i found it hard to understand the morale of this wonderful community, but now i realized it is simple ‘BEST THINGS IN LIFE ARE FREE’. To Kamel and, please stay alive guys, we need you here. God bless you with this an eye opening and the regards you have for! Thanks for the kind sharing. is it necessary to have three candlesticks for the setup? What if there will only be two candlestick before the setup, will that setup still be a valid one? I can work, but experience shows that this system returns the best result the way I explained above. Would you please advised if the pair EUR/AUD just closed last week on 2014.10.24 on a Daily chart. I noticed candlestick on 2014.10.24 closed below Lower BB1 and two subsequent candlestick before 2014.10.24 , closed above Lower BB1. Hence, is this a valid Bearish (sell) setup? Thank you very much of your introduction of another enhance setup! Candlestick 2014.10.24 is not closed below Lower BB1. This is not a short setup at all. Exactly the same rules have to be applied to the ranging market. When a setup forms we don’t know if the market keeps on ranging or we are at the beginning of a strong trend. We take the setup, and move the SL to breakeven on time. Then we sit back and watch. Time will tell if we will have a trend, or the price will turn around and stay in the range zone. Thank you for sharing this with us. You guys are awesome people. I am new to these, did a lot of wrong things, hence have not been profitable yet. However, you guys gave me hope and the believe that all is going to be ok. I am addicted to’s post every day and the comments very informative too. dear Kamel is it must to have two candels closed below the BB1 . If # 1 candel is closing below the MB, # 2 candel is closing just below the BB1 in an uptrend . and the #3 candel is closing above the BB1 . will it be valid trade setup to trade long . Hey Vinod, It is still a setup, but you’d better to go for the typical setups I explained above. Let’s keep it as simple as possible and not to have too many exceptions and extra rules. Hi Kamel, Great article. Good strategy. Welcome back. Would like your daily post. Hi Kamel, Thank you for sharing his. It’s a great way for entering a trending market without having to wait for a typical strong set up. For learning to identify the setup validity. Is the pair GBPCHF on monthly closed candlestick on 2014.05.01(closed above BB1) with previous 2 candlestick 2014.04.01 and 2014.03.01 (both closed below BB1) , as a valid BULLISH(Buy) setup ? 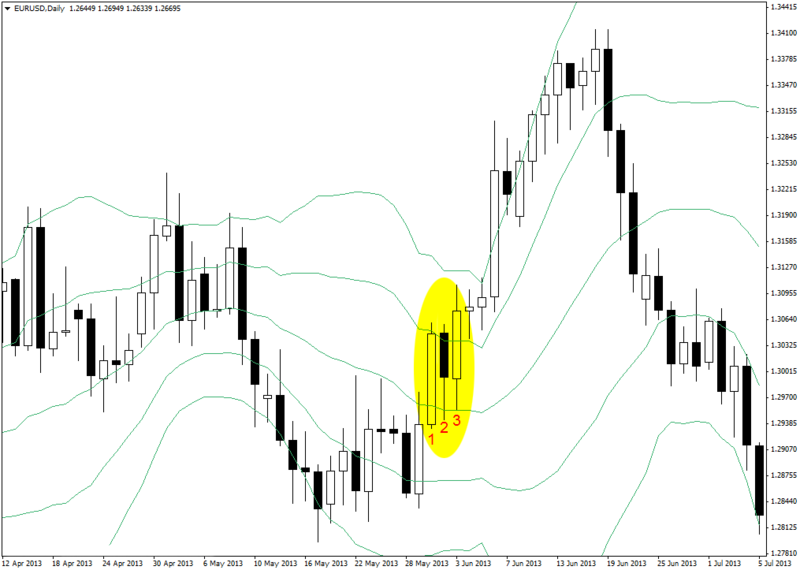 Apology, I did not indicated properly of previous GBPCHF monthly chart. It should all at UpperBB1. Another pair for learning again. 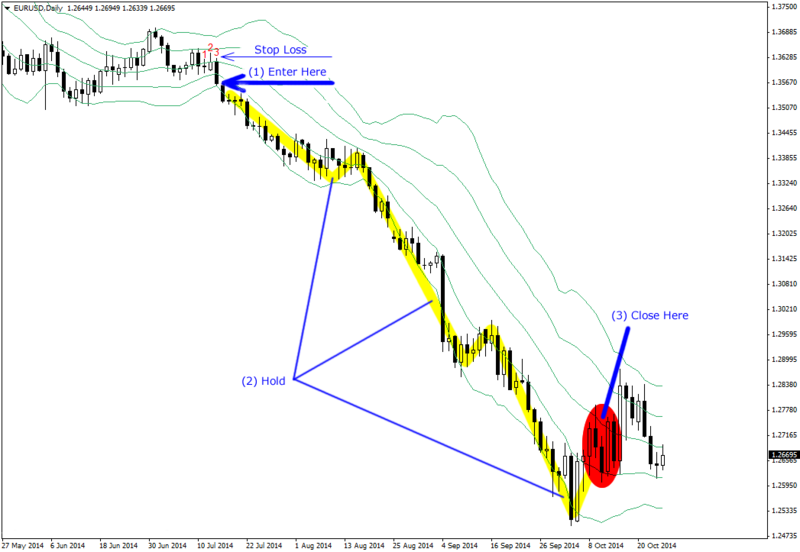 AUDCHF weekly chart. Candlestick closed on 2014.10.05 was below LowerBB1. 2 candlestick before (2014.09.28 & 2014.09.21) closed above LowerBB1. So, is these a valid SHORT setup ? 2014.10.05 candlestick on AUDCHF weekly, is a short setup. Thank you kamel for a very brilliant post. I’m so proud and pleased to be associated with such loving and kind hearted people like you. Please never stop writing to us. I read these posts with the greatest of pleasures! Could you gentlemen kindly explain the BB head fake to me and how it might be involved in ‘our’ beautiful trading system? I just would like to hear how you gentlemen explain this phenomenon. Once again, Kamel… Thank you! From the very bottom of my heart. I wish you both long and continued success in everything you do. Boy! Aren’t we all just so lucky to have these guys guide and care for us!!! I know I am. Thank you. & Kamel… Stay well and take good care of yourselves for our sake!!! I don’t think that BB head fake can make serious problems for us. We have to be aware that our stop loss can be triggered sometimes with any trading system we follow. In case of BB head fake, in most cases it can not affect our positions, because we move our stop loss to breakeven as soon as the price moves for 1SL toward the target. question on the AUDCAD daily chart 2014-10-24 candle – currently in’s system we are short – the current candle looks ominous against the trade and this is also now a long set up under Kamel’s system? No, it is not a long setup. 2014.10.24 candlestick is closed below BB1 upper band. Hi Kamel – thank you for answering – I am sorry to have wasted your time – I did not check MT4 platform – I used a candle from my brokers data (not MT4) which had the daily 2014/10/24 candle closing the high at 0.9850 which is above the BB1. Hence my concern. Sorry to waste your time -However, I did not waste mine as it has shown me to be more careful and always check MT4 – closing times obviously have a considerable impact and it reinforces what says – “until the candle closes …. we do not know where it will finish”. In this case I happened to be watching at 10mins to close and the price was equally performing on both MT4 and my other platform. I am very surprised and a bit confused at this revelation. Hi Peter. You did not waste my time at all. I will be happy to help. The daily candlestick close time is very important. Any platform you use, make sure that daily candlesticks close at 5pm est. The W1 of EURAUD closed above BB1 on 2014.10.12 so we go long on 2014.10.19 (W1) and this SL triggered? Yes. Your SL will be triggered sometimes. This is the only thing I can guarantee. re stop loss triggered sometimes – ” this is the only thing I can guarantee ” This has to be the most honest thing I have ever heard from a mentor of trading. Perfect! And as says – nothing is sure in anything – The old saying ‘ its as sure as a Suisse Bank ‘ was even stopped out. I’m not sure if the watches still hold up though? Hi Peter. Thank you. Trading is nothing but taking risks. Where the price will move when we enter is what we really don’t know. The only thing we can do is limiting our risks and losses. There is no doubt that our stop loss will be triggered sometimes. This is what we can not do anything about. Something that makes us profitable at the end of the month is that we enter properly, make our losses small, and our gains big. If so, and if we trade the way I explained above, even if we win 51% of the time, we will end up the month with profit. And the AUDJPY W1 2014.10.12 short trade still valid? If so it’s against with Mr.t set up? reported a short trade setup formed by 2014.09.07 candlestick on the weekly chart. Is it still valid after closed W1 with strong bull candle 2014.10.19 (after a doji 2014.10.12)? There is no short trade setup on 2014.10.12. Actually a long trade setup is formed by 2014.10.12 and 2014.10.19 candlesticks. I would like to say Thank you for your new method. Its very kind of you sharing with us. Anyway I have a question regarding your new system. In spite of opening the new trade( either long or short), does the 3rd candlestick have to be a long candle stick? Can it be a short one? Also, in case of the 3rd candle stick breaking the BB2 with very long bullish or bearish candle stick, is it still the right time to go long or short? Will it be effective? 1. No, it doesn’t have to be a long candlestick. 2. It will be riskier. I don’t take it. Is this method (DBB) still valid as bb is squeezing? Does it have to be applied while BB is expanding? Can the 3rd candlestick be closed in other forms than full bullish or bearish form? Is it still valid if the 3rd is closed as a doji? The candlestick close price is important. In this system we don’t care about the candlestick form. You can use it whenever you see a trade setup as described above. your article about candlesticks shadows was one of the best articles i have ever read about. thanks for you good articles. i have one question. usually a good Long trade setup formed when candlesticks break Bollinger lower band. i mean a good uptrend usually start from Bollinger lower band and go up to Bollinger upper band. in this method we lost half way of an uptrend. am i right or i misunderstood the method? With this trategy, if the stop loss get triggered, do we re-enter or we just wait for the next one? Hi Abbas. We will have to wait for another setup. Nice and simple trade system! In regards to your exit/SL, do you typically trail your SL or just wait for the candle to cross back over the BMB/BB1 to exit? You mentioned both options but it appears that you prefer to wait for the cross back rather than trailing the stop. I guess waiting for the cross back allows for the bigger trend runs but the trailing stop prevents you loosing your profit if a trend doesn’t happen. Hi Daniel. I sometimes move my SL further, but I don’t take it too close to the market movements to give enough room for the price fluctuations. Could you tell me the candlesticks (#1 and #2) are MUST closed between BB1 and BB Middle Band or they just need close anywhere above/below BB Middle Band? It is better if they close between BB1 and BMB, like the examples I showed you above. It would better if candles #1 and #2 close right below BB1 upper band in case of long, and above BB1 lower band in case of short trade setups. This is the typical trade setup. Thanks a lot for the great strategy, it looks good.. But, are there any special tips or tricks for this strategy? I tried to do this strategy with 4H timeframe on multiple pairs but I got more losses than gains.. There is no tips and tricks. It is as simple as it is explained above. Trade the daily, weekly and monthly time frames using this strategy and look for the trade setups exactly as it is explained above. You will have a lot more gains than losses. I have read all your articles. They are brilliant. I am glad that you are writing and generously share more awesome knowledge again. I have one question about the DBB. I would to know the logic behind this trade set up. It would be very useful to understand the mechanism of how the price react to it. This is not I don’t believe your trade set up . I feel this is another effective trade set up and yet very simple which accounts for both statistics and the market psychology, thus I would like to know it better in details. I understand that 1SD and 2SD can be interpreted as probability under normal distribution, 68% and 95% with regard to the price’s volatility. So, does it mean that while the price move within the range of midBB and BB1 (normal market), and then suddenly the price pierce through the BB1 (go out of the range 68% confident interval, 1SD) indicates that the bull start to gain power and take control of the bear? Do I understand it correctly? Please correct me. About the logic behind this strategy, honestly I don’t know more than what you explained. This strategy is not invented by me. I initially learned it from and other senior traders, but I used more seriously than the others. I know that there are so many traders who use this strategy. Awesome article. Keen to give it a go. Just a question, I noticed on 2 of your long trade setup examples that either candle 1 or candle 2 were closed above BB1, but you mentioned that we have a setup if these are both closed below BB1. How critical is this? Thanks in advance for your reply, and also thanks a million times for the unselfish efforts of and yourself in helping us become profitable traders. Are you sure that candles #1 and #2 are closed above BB1 upper band? I don’t think so. Please check one more time. Thank you for your comment and welcome to LuckScout. Glad to hear you like our articles. Thank you for sharing another strategy. Is it really profitable? Could you please share its characteristics (especially profit factor, possibly loss rate (stop loss hit at its initial place)) based on your experience? It’s so mechanical that it can be automated relatively easily, and backtest on the daily chart. I will do it as my time allows, and will share my results here. If one trades exactly as it is explained above, yes it is profitable even if only 51% of the setups hit the 2 x SL target. I have not calculated the profit factor, but it has worked for me for years. I would be really interested in even a rough indication of how profitable this system has been for you. Like an average of 0-5% per month, 15-20% per month, or somewhere in between? It would boost my confidence a lot if i knew that someone has used this for years with decent profit. Oh boy….Hi Kamel. I bet when you and discussed whether or not to share this strategy then probably warned you about all the feedback you would get about this…..lol! It took me 15 minutes just to read this post. You guys are the best……..
Hey Pete. Thank you too. Today I just try your DBB system on GBPUSD H4.. Happy to said it worked.. It hit 2 x SL target (long position).. Next I will try in bigger time frame.. Many thanks to you for your simple technic..
Actually I already take position & enter at the right time plus already take the profit.. I will try find more setups in bigger time frame.. Cheers..
Good for you. We were late. Really easy and interesting system. Keeping it simple stupid. I really am interested in following the system. 1. Following the system, how can we afford consolidations and little trend pull backs? 2. Must candlesticks 1 and 2 form and close under the BB1 or only close under it (Long Setup)? 3. Can you please give us an approximate win rate of this strategy ? Thanks a million times. Most of the people these type of secrets are sodding very high price. But you are generously helping to willing people. Firstly I am new to and and have recently came across your page in the last few days. I wish to thank both of you for sharing with all of us I will be putting this system to work today and will continue to read your articles which I find extremely interesting and simple thank you again guys I hope some day I can be a successful trader. The double bollinger band if not mistakenly was from Kathy Lien, right? I would like to know that have you develop the drawdown % for the DDB system? We have been using this system for 15 years. Almost all professional trader know about this system. It is neither invented by us, nor any other known person. No, I don’t have the drawdown %. I got a doubt on candlestick chart. I found that different brokers provide different trading hours thus it would affect the form of candlestick. if like that, may i know which is the best timing to follow? GMT-5? GMT+2? or any other? What server timing your broker offer to you? Hi Kemal , I really love this BB system, its great, but there are just not enough setups in week over 19 pairs for me to trade it full time .. But what you guys are sharing here is really great, thanks you very much . Michael..
Hi..thank you so much for the report. 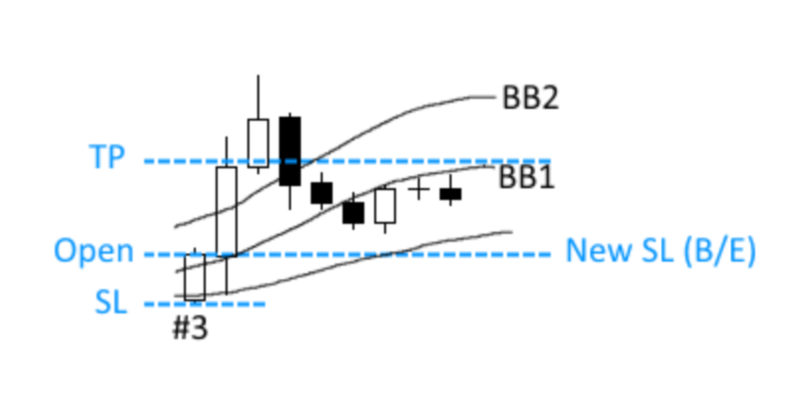 Can you kindly let me know if the close of third candle is above BB1 upperhand and close of previous two candles are below BB1 LOWER hand….what stand I should take. There are clear rules on forming the trade setups. They are explained above. What you mentioned cannot be known as a trade setup. Just getting clarification on DBB strategy. My question is in a long situation, whether the two prior candlestics (the ones below BB1) need to be bullish candles or can they have their close prices lower than the open prices? They don’t have to be bullish. The just need to be closed at the right place. I’m practicing using the DBB system and had one winning trade already. A good one, Short,GBPJPY 12/16/14, $1106 profit. However, a later trade, Short,NZDUSD after the 12/17/14 candlestick, (Daily chart), closed below lower BB1 with Candles #1 and #2 closing above LBB1, went sour. I interpreted this situation as a Short trade setup since it conformed, as I understand, to the DBB Trading rules. The trade went against me and hit SL after going up rather than down. It’s still going up! What did I miss in evaluation of the setup. It was not a typical short setup, but still a short setup. Please see the above examples and you will see the difference. While I sincerely appreciate your mentoring, even as I strive to comprehend the DBB strategy, presently, I am very confused: referencing the USDJPY Daily,the 2014.12.16 candle clearly closed below LBB1 while candles #1 & #2 closed above it. Now, according to the rules in the above article, this should constitute a “Short” trade setup. Yet, as you can see form the chart, price has moved “up”, from the suggested entry point,(close of candle #3), some 2500 pips as of 12/18/14, 0013hrs, UTC. Could you please help me clarify this confusion. If you prefer please reply privately to my email. Kind regards and many thanks for your mentoring. Hi Jeng , Michael this cool site and saw your here not Kamel , I was just sitting here catching up on some reading and saw your post . If I may answer you ? The candle on 12th did not close below mean the 20 and was a indecision candle spinning top.The candle on the 15th did . But also,this has been a strong up trend for long time on daily ,weekly ,and monthly ? So based on all things, mainly the rules of BB. The candle did not close below the 20 , this is not a sell .Not sure how to give a picture of this anyways .. There is never a guarantee where the price will go, even with a perfect trade setup. No trader in the world can predict prices. There are probabilities only. By picking only the optimal setups, you filter out a lot of bad trades (and some good ones as well, but overall, profitability should increase). In your example, candle #2 is good, but candle #1 isn’t, because it closes above the middle band. Also candle #3 closes almost below the lower BB2 which is also not optimal, but still acceptable (these extra rules are explained in the second article i linked. I have just begun to use them myself. Hi Jeng , I meant to type , This is Michael not Kamel ,and was just reading some posts , not sure what happened there in begging of my comment , but the rest of post is straight ..
Is DBB recommended to be traded only on Daily or can we apply it to Weekly and Monthly please? If yes, how exactly do we trade it on Weekly and Monthly? Yes, DBB can be applied to weekly and monthly time frames. The rules are exactly the same. Thank you for your response. What I actually mean to ask is following the rules on weekly and monthly would require huge stop loss setting and was thinking there could be a way to trade it on daily. So is best to leave it if cannot be traded according to rules? If your account cannot handle wide stop loss orders, then you’d better to forget about trading the long time frame. Of course, trading the shorter time frames also increase the risk. and it should complete more as it doesn’t detect some of great trends. it is not a rule for every pairs and correct every time but some times it shows huge profits. Thank you for sharing this knowledge I’ll be sure to keep this spirit as i grow and become more confident and profitable. I noticed that in some daily chart examples there are five bbs and four in others, is this due to zooming while captured? Thanks again. Yes, it is because of zooming. I apologize if my questions have answers in the comment’s I normally try to read the entire page to keep redundant questions off you guys but honestly its late and my batteries is about to die and the power is so i want to get it posted and i value every word on this blessed blog. I noticed in the going short chart examples a cpl had candles one and two closed a little above bb1? The only reason I could think of would be they formed strong patterns like in the bb break out system. thank you. – first 2 candles doesn’t play role in the strategy and are useless, as they are filtering out many otherwise profitable trades. Good that you backtested it. How much did you risk per trade to get to these results? How is it going with your modified DBB ? I am a novice starter and still loosing money :), Thank you very much for this site it is educating me a lot. I couldn’t understand the breakeven idea .. I mean How? can you please explain further.. or if there is a link that I can look at for detailed explanation ..
Breakeven is the entry price. You can move the stop loss to breakeven when your position is in profit. If so, your position will be closed with no loss if the price goes against you. Do i understand correctly, you wait until the daily candle closes and at that moment you make a decision? Or is it possible to look at the candles on a different time during the day and act then? For me the daily candles close at 6 in the morning so i would have to wake up early (and yes, if you say it’s necessary, then i will set my alarm clock early 😛 ). You can use this method on any time frame, but daily and longer time frames return better results because they are stronger. It is OK if you check the daily chart even at 8 am because usually markets don’t move that much during that two hours. This is a good news for me too as I have to wake up 3.30AM in the local time. In the first sentence, the “or above the Bollinger Middle Band” seems to suggest that candlesticks between the middle band and BB1 upper band are fine and the position shouldn’t be closed. The second sentence says the opposite? Maybe that paragraph (and the corresponding one about shorts) could be clarified a little. Does this rule still apply if this happens between SL and the profit target of the first position? What i mean: there’s a buy signal and i open two positions. The first one’s target (at 2xSL) is hit, leaving just the second position. The price doesn’t go higher, but instead falls to between the old profit target and the SL (which has now moved to break even) and here candles close below the BB1 upper band (but this is still above break even). Do i follow the rule i quoted, or do i leave the position open until break even is hit or until it goes above the old 2xSL profit target? Sorry for the wall of text for a single question, but some details are not clear to me. In this situation, would you close the second position, because the most recent candles are closing below BB1, even though you’re below the TP of the first position? What about if the next candle closes below the middle band, but above the B/E? Yes, I would close the second position. During my daily round i noticed that i may have been doing something wrong since i started with the DBB strategy (less than a week ago). I was moving the SL of both positions to break even when the price moved 1xSL in my favor. But now that i read the article again (see the quoted text below), i see that i should only move the SL of the first position and that i should not move the SL of the second position until the first position hits TP. Is this correct? Or does it not matter? When the first position hits the TP, you move the SL of the second position to breakeven. If the first position is 1:1 which means its stop loss and target sizes are the same, then when the first position hits the TP it means it has moved for 1xSL. I’m sorry, i think i haven’t explained myself well enough in my previous comment. The way i interpret the above quoted text is that if the price is at 1.5 x SL (or anywhere between 1 x SL and 2 x SL), then the SL of the first position would have been moved to breakeven, but the SL of the second position has not changed and is still at “-1 x SL”. So at that point you have two different stoplosses, is that correct? You don’t move the SL of the first position. You move the second position SL when the first position hits the TP. In that example, my target would be 120 pips. What i wanted to know was when to move the second position to breakeven. Should i do that when price is at +60 pips ( at the same time i move the SL of the first position) or when it’s at +120 pips (when the first position hits TP). Again, sorry to take up your valuable time, i realize you must be very busy between writing all these wonderful articles and answering questions from other people. It’s just that i want to be 100% sure about the rules. If i’m doing something wrong, I’d rather find out now than in 6 months. Sorry for my confusion. 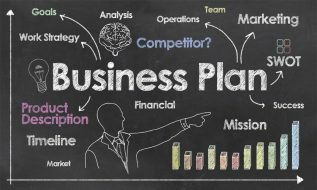 The above article is written by Kamel and that is his strategy. I don’t move the first positions stop loss to breakeven. Glad to hear you have been doing good so far. Not really sure, what you don’t understand on this simple strategy. Just read it multiple times and watch examples from authors. Only valid questions on them are, if they backtested their strategy and what’s the success ratio and average win/average loss ration. I have simplified this strategy to maximal extent and even increased the profitability and proved it in backtest. So if the original strategy is too complicated to you, you can use the rules i have posted above. It’s an amazing strategy that only very few generous-minded people dare to share. Can I know what percentage you earn monthly/annually by applying this strategy? I think that can tell us more about its success rate. It is impossible to answer this question, because markets behave differently every month. Please read the below comments. Some trader have back-tested this system and published the results on this page. can you tell me how to download Double bolinger Band…. It seems to me that the trade is setup today at the euro/usd. 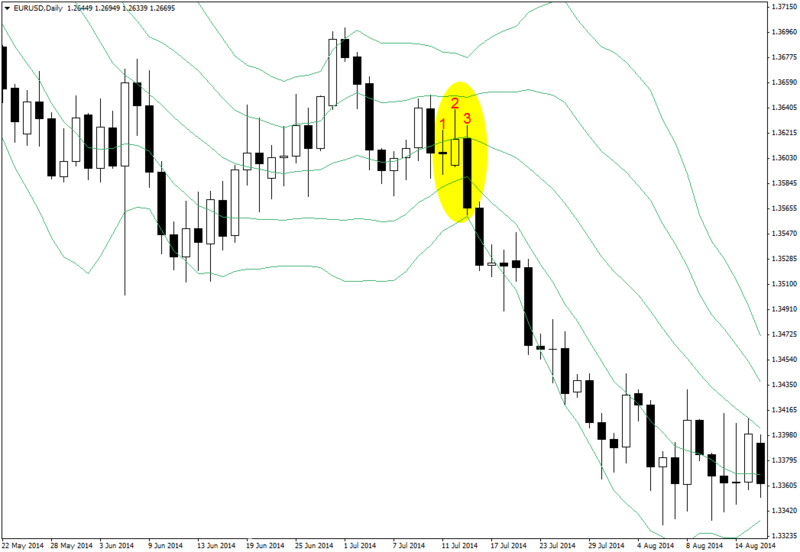 A long trade setup on EUR/USD daily chart? Thanks for the welcome and the wonderful site you got. Yes indeed that is what I meant. I am desperate that you did not answer my question on Mar 5, 2015 on this same thread..!! Meanwhile you keep on responding on others’ comments.!! Sorry about that. I just answered that comment. Is the opposite direction for the DBB setups also “true”/likely to succeed for often than fail? I can see exactly that in the gold chart right now, but maybe it’s a coincidence, because of the 1200 USD psychological mark. Please upload an example to tinypic.com and share the URL here, so that I can see what you mean exactly. Thank you. What I mean is technically a “reversed DBB setup” so from the top to the bottom. I guess it’s a coincidence and not a setup. Today’s candle shows me that it’s retesting the 50 SMA, so I assume the reason we went down was the 50 SMA. Thank you for sharing this. Hope you don’t mind if I say I have no comment on this. It has to be back-tested to see how it has worked in the past. I am appreciate to find this site as I am novice in trading and thank you and your friends for such huge support, almost read all 5 steps and trying follow your points. I am at stage of analyzing and practicing, so I have question: USD/JPY daily 11.02.2015 long bearish candle formed engulfing pattern, strong breaking upper BB, from everything what I read here, it is strong short setup, but price went up, what was confirmed by DBB strategy with 14-15-16.02.2015. May I know what did I miss? 1. We don’t take the short trade setups that the participant candlestick has a considerable lower shadow in it. The 2015.02.12 candlestick has a too long lower shadow. 2. Sometimes even the best and strongest setups hit the stop loss. You have to be prepared for it. It is unbelievable what you do here guys! I am just overwhelmed. Have you ever check what is the winning rate for this strategy? It looks so simple to follow and yet effective. One more time, Thank you so much for the great work. I haven’t done that, but if you check the above comments, you will see that some other LuckScout members have done it and shared the result. This is such a great strategy for us working stiffs thank you Kamel for sharing. Thank you for sharing a system so effective and simple with all of us and for free. I just stumbled across your free system online, since I just completed a very similar daily system myself and looked for ideas to finally make it work. I created one with a quite similar idea to catch trends in the beginning. Since I did not know a better way, I based mine on moving averages and candlesticks but I find your approach with two sets of Bollinger bands a whole lot more comfortable and precise than MAs alone could be. So your way to keep things simple is just incredible to me. I plan to apply that system as soon as possible. First I need to refund my account, because I let mine be torn down by a lot of mistakes identified in his article about greed. So I hope to do better in the future. You and are incredible, unselfishly educating people with true wisdom and encouragement. My ultimate goal is to be able one day to give wisdom for other people to prosper just the way you guys do. I am truly greatful and will keep reading your stuff and learn and master everything you share. So, can I use it to trade the continuation signals when I’m not sure about the reversal patterns? You can trade when a trade setup forms. There is no other rule. Thank you and Kamal. Testing DBB on demo. Looks very promising. This trading system is simple and effective. Just started back-testing it and collecting the information on other articles and your comments. Would you please tell us that the article about making the first 100000$ applies to this strategy or not? – how long have you been trading it for? 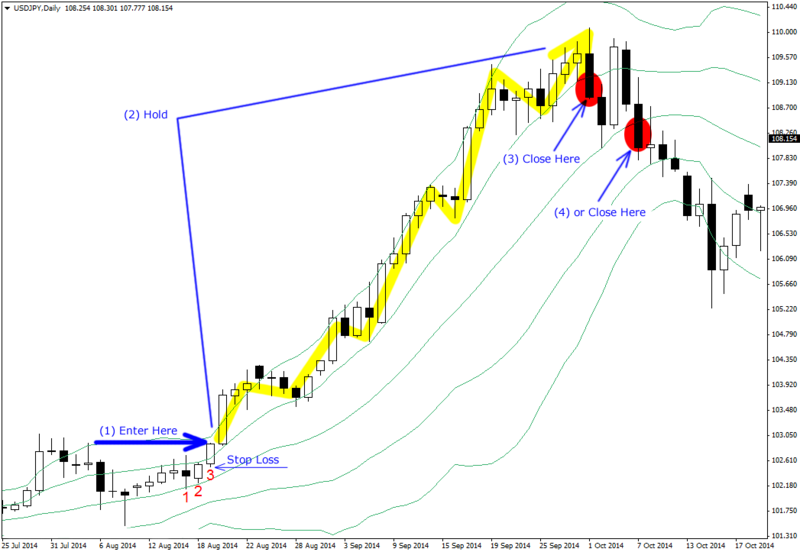 – Are the results in terms of achievable monthly return, similar to the main candlestick + bollinger system? I am somewhat new to technical analysis in general, so I was thinking of trying this system alone because it is simpler and seeing if I can handle it alone, without using the main system. what happened to Kamel??? Many days have passed since I last saw Kamel articles last in this site. I hope to get something new from Kamel. hi kamel,DBBs is not working in my platform? God bless you for such another great great article. I need your confirmation, regarding to your example given above, in case of long trade setup, it doesn’t matter if the #1 and #2 candlestick are bullish or bearish. Only the #3 candlestick have to be bullish in case of long trade setup. Am I right? Thank you so much Kamel and. i have studied enough articals on LuckScout, actually all of them starting from 2012. i have found DBB very very simple and easy. sir my question is that can i use ONLY DBB in my demo untill i learn regular candlestick system. Yes, you can. Why not? You can use it with DBB system. Are you saying that trading with the stochastic system that you taught us and use it on weekly timeframe, we can be consistently profitable? Thank you! If we trade on weekly and monthly, then we need to have bigger account as the stop loss is wide, don’t we? Please anyone can tell me where can i get this double bollianger bands indicator ! It is explained above. You add 2 Bollinger Bands to each chart. One with default settings. The other one with Dev 1. 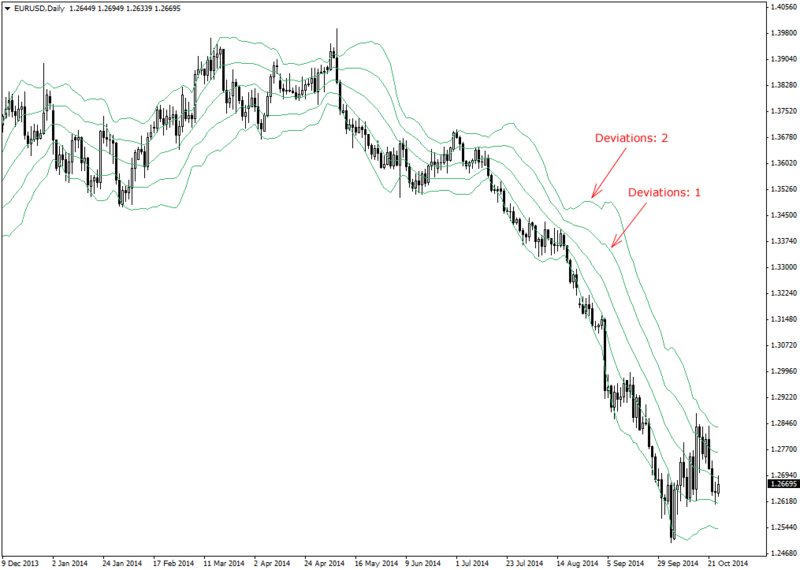 You can add 2 bollinger bands with deviations 1 and 2. If you save this as a template then you can use it again and again easily. can anybody tell me how to use the indicators mentioned in the note above eg singh’s indicator for DBB? i have the same problem. downloaded both indicators, but DBB_indicator_based_on__method seems not to work. am i doing anything wrong ? what do you want to download? I can help. All the links work for me. Oh, I see. Unfortunately I don’t have to source code of those indicators. I hope those who LuckScout users who developed the indicators make them compatible with the new MT4 build. Hope it too… I don’t know how to send them a private message… Hope they are reading this… By the way thank you very much! One that help find strong candles stick patterns please thank you in advance. thank you so much! i will be trying this strategy on my demo account! am i wrong or is it just one of those times?.. I don’t see any signal on that chart. Which candlesticks you are talking about? i have gone through most of this site’s articles since last 15 days and started using DBB method plus daily candlesticks n bollinger method. i have left almost all indicators and only check daily candlesticks at close .if there is a setup and a confirmation daily candle is there after the first one i place the order after checking support/resistance if any nearby.and secondly if any DBB setup available i go for it.i have installed majid’s indicator and DBB indicator also which are of great help. my question is that do i need to check anything else before going for trade because i have left RSI stoch and other indicators cuz they are like thousands and every indicator tells a different story.i couldnt cope up with them .plz tell me if anything else needed? P.S. u guys are amazing trading by your method is much easier. well its around the 18/7-15 on eur/jpy daily market.. i dont know if you can see the link i have set up?.. all signals are bearish, 2 candlesticks over DBB1 lower and candlestick 3 under DBB1 lower.. would love if u can check out the link and see where im wrong, since only thing i can see is im maybe trading against the market? :S.. Yes, I see a short trade setup based on DBB around that area. Of course there is no 2015.07.18 candlestick on the daily chart, because 18th was weekend. Please mark the trade setup somehow so I can see what setup mean exactly. Thank you. What could have been the reason for the two consecutive trade set-up failing to hit the target. and then on 28th July 2015 Eur/jpy also did not hit the turget. Do you have a special explanation for not trading this set-up or was it okay to take the positions? Once more thank you for your energies and sacrifice to teach the whole congregation. I see only half of the circle. By the way, the 2015.07.17 candle formed a sell signal. Now the 2015.07.27 candle has formed a buy signal. 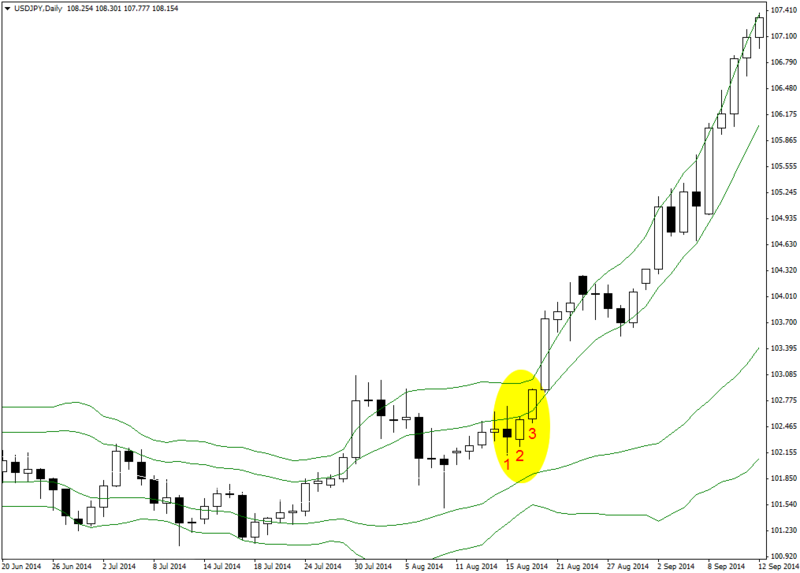 How to make double Bollinger bands. Open your mt4 account or platform and go to the insert button click it select bollinger bands a box should pop up click the parameters it should be 20, 2, Repeat this process and add change the deviation to 1 you should have two sets. Hope this helps. ya i agree with u on the sell on 7/17 and the one a few days ago.. very glad that you agree with me, so i actually can see that im right in my setups :P..
on the 7/17 bearish signal there was a strong short signal, right?.. but it still didnt go up, so its just one of those times where it takes the SL and i try another time, right?.. Has someone written an alert for’s trading strategy? If yes, please share that as well. Thanks for sharing your strategy Kamel. Anything that takes the guess work out of it for us rookies is much appreciated. This is very much amazing, I don’t understand that you trained Kamel and now he explains and shares knowledge, I’m sure you have got a lot of wisdom, from a lot of wisdom you chose to share with us, You are the only one I know in the Universe who has such a kind heart. Surely it is always defeating my understanding! Thank you kamel, been using your strategy for a while now and love it, so simple yet very effective!! I think I have to start using this strategy combine with master strategy and see what result it will give. I love your article so comprehensive. Hi and Kamel and everyone one who works in this site. I am new to your site and just registered few days ago. the information I find here is amazing and so useful like everyone says. I have been reading your articles about DBB strategy and I found it so amazing. I looked at so many patterns specially in EURUSD and I kind of feel the pattern of the candle stick or maybe the length of them or the distance they have from the BB1 upper or lower band can make a difference. In one you articles you mentioned “right below the BB1 upper band, or right above BB1 lower band. I wanted to know what exactly you mean by the word “right” because you just mentioned it in one place and not in the other sentence’s or articles. Thanks a lot for your help and support and your amazing information. “Right” means “exactly” in this case. I’m a newbie to LuckScout and have read your article several times. 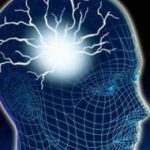 I just want to say thankyou for posting this article because It will help me start making profitable trades. Up until now In have only made small profits and mostly losses trying to trade the shorter time frames. Thanks again and keep posting. Phil. Is it possible to use the DBB Standard deviation 1 for BB breakout with candlestick patterns, because I’ve seen some setups form correctly, and it seems nowadays on many daily charts, standard deviation 2 is hard for the market to reach. Could this be due to algorithmic trading killing market inefficiencies? As I explained once, you can use BB1 and locate the strong candlestick signals. There are so many traders who do it. > Could this be due to algorithmic trading killing market inefficiencies? No. Algorithmic trading cannot affect market. Please kindly share a screenshot as an example, so that I can see what you are talking about exactly. Also I am worried that the the daily candlesticks with my broker may affect my trades. My broker is CM UK. It seems their candlesticks close at 1am GMT+1, which is currently New York summertime/EST+1 8pm instead of 5pm, and it seems to my eyes that your charts are slightly different from mine. Yes, the daily candlestick close time can make the candlesticks shapes different. In most of my screenshots I use the FxPro charts. You can do the same for your analysis, and then use your broker platform only to take the positions. Thank you sir for this new strategy of trading. I would like to know how to add second set of BB to my screen . I tried but could not succed. Pls. guide. Thank you so much sir Kamel, you have solved me alot of headache especially in determining the target and stop loss. I want to ask that, as sir’s trading system BB with with deviation 2,,,,you have told many timee that, strong candle stick patterns like Dark Cloud cover , piercing line and both Engulfing bear and bullish, with break out BUB or BLB breakouts, makes strong setup,,,,but i want wo ask that,,,,as i find that as kamels DBB ( deviation 1) there is also i find many times as well as i trades these setups, that strong candlestick patterns, Dark cloud ( both bearish and bullish, and Engulfing ( both bearish and Bullish) that breakout the DBuB1,,,( bellow BuB2 in case of short trade setup and also DBLB1 ( above the BLB2),,,,as strong setups these type also goes for atlest 2to3 candles or days as same trades,,,,short and long,,,,,,,,,does this work or can i take this type of setups,,,with proper SL and TP..? The best thing to get your answer is that you check the back data and list the setups that worked and the ones that didn’t. How to use this strategy in Amibroker software ? In Amibroker we have parameters like Price Field, Period & Width. You have to change deviation to 1 for one of the BB indicators. That is all. Can the DBB strategy be profitable using 4 hour charts? Or is it better to stick to Daily and longer time frames with this strategy? The longer the time frame, the stronger the signals. Shorter time frames will have more losing positions. Ok, I’ll stick to longer time frames. Thanks again! I would like to know when you mentioned you check only 15 minutes a day to check for a setup, does that mean you are only looking for (1st candlestick and 2nd candlestick close below Upper BB1 and 3rd candlestick close above Upper BB1) setup only? or is there any other form of setup? I hope you understand my question. Hello Anton Praja I have opened position on this currency pair on 10.23.2015 based on DBB strategy. I am still still holding the position. 1. Does the color of the candle(candle no.1) matter?. You guys make a huge effort to teach us everything you know. That method seems interesting, I will give it a try. Sorry if there has been already an answer, but is the strategy suitable with CFD and metals charts? And if no, why? Thanks a lot. Dear,So thankful for your hard work you have done so far to improve our trading skills. Special thanks to Kamel for this simple and effective DBB strategy. Thank you for back test Report of this strategy by JojoW . Another confusion. After 14th March, there was a selling signals but after Candle stick #3, which was closed down BB1 lower band, prices startd going up all of a sudden. can you please teach me I am brand new in the currency trade. # how much news effect in daily chart with this strategy ?? # whats condition before news ?? Hi Kamel and. Found the LuckScout website only yesterday and am in the process of reading through your articles. Very interesting stuff, but I’m a bit confused by the two different types of ‘double bollinger bands (DBB)’ trading approaches.’ strategy in a nutshell: “The strong candlestick pattern with a strong Bollinger Band breakout have to be formed on an “exhausted” market, not on a too strong trending market.” On the other hand, the DBB strategy that Kamel recommends ‘trend continuation’ setups (my interpretation). I don’t see how to combine these two different approaches to trading (‘trend continuation’ versus ‘Breakout/trend reversal’). Thanks in advance. How do I set up the alerts indicator? I have downloaded and installed both indicators but I can’t find how to set the alerts. It’s not available in my indicators section. Someone please help .. if you know how to set the arts up please email me at SauceSSPC@gmail.com … Thank you very much for everything! Do you always set a market order when an eligible candle closes, or is a pending order an equally plausible entry? If so, would a pending order have to be cancelled if not triggered within one bar? I don’t set pending orders. > If so, would a pending order have to be cancelled if not triggered within one bar? It depends. Sometimes a bar is too small and doesn’t touch the pending order. So you will have to give more time to the market to hit the order. Thanks! One followup question, is there a particular reason you don’t use pending orders? Did you test this, or is it more a style-of-trading thing? Thanks, and happy trading. It is more a style. I prefer to see the market first and then take my position. My brother uses the DBB system and seems to like it. Great explanation brother thanks! Thank you Kemal for the article. Although I have read before, still this is invaluable article to remind me. I wanted to find out if you use DBB as well? I don’t use that system. is there any indicator to support this methode, i found unsual in EUR USD, here i send the screenshot, if we found like that what should we do to anticipate it ? Hi, I am new here (September, 2017) and I’m already addicted the articles on here. I like that you guys are simple and realistic. I look forward to many more great articles.